Q: What makes a good sled dog? Martin Buser: A good sled dog is a lot like a good person: honest, hardworking, friendly, with a positive attitude, and curious. Other dog characteristics include good appetite, good feet, and an ability to run fast for a very long way! The physical traits and muscular structure of the dog's body are important, but the best dogs are the ones with heart, willingness, and the desire to get the job accomplished. Lead dogs show signs of being leaders from puppyhood. They are usually very curious and spunky. As they get older, they show that they like to be in charge and can learn the commands very quickly. Mitch Seavey: There are physical characteristics that a dog must have. If he doesn't, he's just not going to make the team. No way. No Cinderella stories there. Beyond that, it's mostly attitude. The dogs have to be committed and dedicated workers. They need a combination of speed, strength, and attitude. Gary Paulson: Leaders kind of select themselves. You try all the dogs and see what they do. At least that's what I liked to do. A true leader just goes to work. Most dogs don't want to lead. They will hesitate. The ones who want to lead just go for it—they are hard chargers. Q: What are your dogs' names? Martin Buser: [In our family], we sit around the dinner table and think of theme names for litters. Pups born at Christmas have reindeer names. We never name them right away. We wait to see their personalities. My dogs have names like Blitzen, Blondie, Fearless, Ingot, Kira, Melkior, Odo, Riptide, Stream, and Worf. Q: How do your dogs deal with the freezing temperatures? Martin Buser: To them, of course, these temperatures are comfortable. They are used to being in them. They perform better in cold temperatures than in hot. When it gets really cold, though, we have to be careful that the dogs don't get frostbite. We protect them with dog coats and blankets, and we make sure they are not too exposed. Q: Is there a special bond between the dogs and the musher? Martin Buser: I am very, very close to my dogs. They usually let me know how and what they are feeling in their own language. It's dog language—a lot of body language. It takes a lot of intuition: I know the dogs really well and understand what they want. It is just communication on a different level. It's like knowing your child is going to be sick before the child actually gets sick. Mitch Seavey: We can tell a lot about the dogs from their attitudes. There's a whole nonverbal language they have with each other. The bristling of hair, arching back, ear movements: I'm good at reading a lot of it. I can read what they are thinking, can relate to my dogs as one of them. Dogs have more senses than humans do. They know things they couldn't know with just five senses. My dogs know things that have happened someplace when they've never been there. They can find their way on trails they've never been on. Being around dogs a lot, we start to develop some of the same abilities the dogs have. I can communicate with certain dogs of mine nonverbally without looking at them. They know what you're thinking sometimes. Gary Paulson: Dogs are almost religion to me. They are the best thing that ever happened to the human race. Here is an animal that just loves. It doesn't give a darn who you are or what you are. It doesn't care if you're rich, if you're poor, if you're ugly. They just worship you and will do anything for you. They will lay down their lives for you. I have had dogs that would take out a rattlesnake for me. Q: Are there mushers who don't take care of their dogs? Mitch Seavey: Not in the Iditarod! 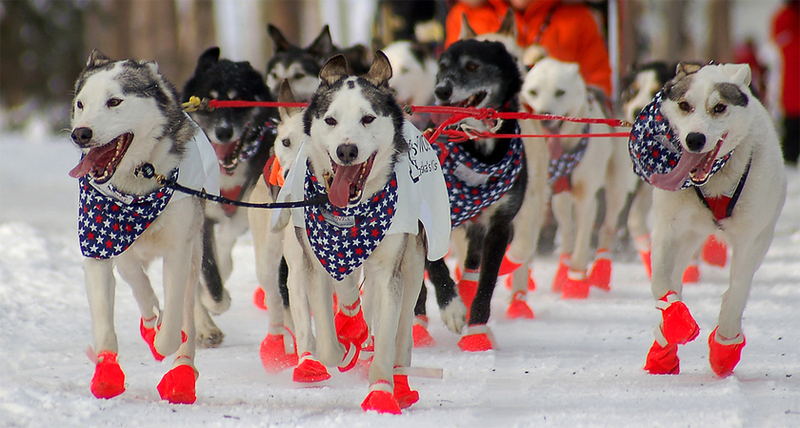 If you're not going to take care of your dogs, you're not going to run the Iditarod or any of the prestigious races. If anything, the mushers are spoiling their dogs. That's another whole side of it. I'm not saying that there aren't sled dogs somewhere not being take care of properly. But those aren't the mushers with the wherewithal to run a race like the Iditarod. Q: How do you reward your dogs after the race? Martin Buser: They get the best food, the best attention-all kinds of hugs and treats and walks - just continued love like they get all along anyway.